According to various industry experts, 15% to 30% of the quinoa harvest in Peru for 2017 has been destroyed by adverse weather. Mercadero therefore expects the production volume for 2017 to range between 70,000 and 86,000 tons.1 Due to extreme drought late last year and early 2017, at least 10% of the quinoa fields in Puno were affected. Heavy rainfall and floods challenged the production throughout the entire country during the first three months of this year. The quinoa harvest is currently in full swing, but official figures on the harvest will only be published by the Ministry of Agriculture later this year. The prices for Peruvian quinoa have increased (OrganicCrops, 2017). This is explained by a combination of factors, including an increased international demand, low levels of stock among producers and increased transportation costs due to the heavy rains and floods. Similar to the problems experienced in the quinoa sector in Bolivia, drought has challenged the growing season of quinoa in Puno. Puno is traditionally the largest production area of quinoa in Peru, and accounted for 45% of the production in 2016 (Table 1). According to the Dirección Regional Agraria (DRA, 2017), 3,300 hectares of quinoa production in Puno had been affected by the shortfall of rain by mid-February. This equals 10% of the total production of the region. Brucce Echenique, Director of De Guste, informed us that his company and its producers already lost 36% of their production in Puno by mid-February. After an extremely dry period between August and December, the weather improved, and with the rains part of the crop restored. As a result, the harvesting season started a couple of weeks later than normally. P. Figures for 2016 are provisional. Source: Ministerio de Agricultura y Riego (2016), Boletin Estadístico de Producción Agrícola, Pecuaria y Avícola. While Puno was confronted with a lack of rain during the beginning of the growing season, other regions have been challenged by heavy rainfall. 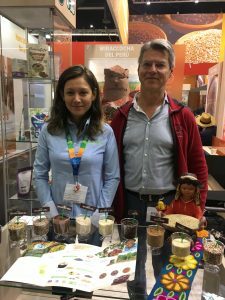 At the BioFach in Germany, mid-February, various Peruvian quinoa exporters confirmed that there has been a lot of rain, especially in Ayacucho and Apurímac. Nevertheless, a good harvest was still expected at the time, and the plant was growing well in most areas. Sofia del Río Castillo, Business Developer at Wiraccocha, explained that as a result of the heavy rainfall, in some areas the young sprouted plants were damaged. The plant can break at the stem, close to the soil. Some farmers put rain caps above the plants to protect them. Brucce Echenique estimated the loss because of the rainfall to be around 30% in Ayacucho and Andahuaylas by mid-February. Various news articles report that heavy rains, flooding rivers and mud slides continued to challenge the agricultural sector in March, especially in the North and East of Peru. Many regions have been affected, including Puno, Ayacucho, Apurímac, Arequipa, Junín and La Libertad, the regions where quinoa is being produced (Table 1). The floods have destroyed 12,000 hectares of agricultural land throughout the country. The government extended the agrarian catastrophe insurance to cover producers throughout the entire country for a range of crops, including quinoa. By mid-May, OrganicCrops reported that the recent poor-downs and floods have drastically damaged or destroyed the quinoa production in certain areas. This comes on top of an already disappointing harvest caused by the effects of el Niño last year, due to which the harvest predictions were already 30% lower. While there is no accurate overview of production and yield available yet, OrganicCrops is counting on a decrease in product availability. Yield estimates provided by Duilio Cori, account manager at Villa Andina, are more favorable. Villa Andina expects the total quinoa yield in the country to be 15% lower due to the rains affecting the growing season during the first three months of this year. Apart from the rains, floods and mud slides affecting the crop in various areas of the country, the rains also caused pests and diseases to occur at a higher scale than usual. Meanwhile OrganicCrops Quinoa Price Alerts informed that the price for quinoa from Peru has increased since the end of February. Suppliers are running out of stock, because of an increased international demand, especially for red quinoa and organic quinoa. Furthermore, costs for transportation increased, because due to the rains and floods it was challenging to bring the quinoa from the different cities in the country to the capital. Recently, 2016 stock is being sold in the market at considerable discounts. Consequently, quinoa prices have slightly decreased, but they are still much higher than in the beginning of this year. This range is based on a combination of statistics provided by the Ministry of Agriculture and estimates from industry sources. The intention to cultivate quinoa for the agricultural cycle of 2016-2017 in Peru was 67,475 hectares (Ministerio de Agricultura y Riego, 2016, Encuesta Nacional de Intenciones de Siembra 2016). The yield for 2016 was 1.5 tons per hectare (Ministerio de Agricultura y Riego, 2016, Boletin Estadístico de Producción Agrícola, Pecuaria y Avícola). Combining these figures, the total expected production volume could have been 101,213 tons (67,475 x 1.5). A loss of 15% to 30% of this potential production volume results in a production volume between 70,849 to 86,031 tons.